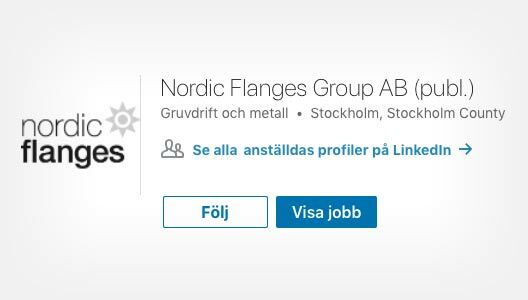 Nordic Flanges AB is a leading supplier of industrial flanges in stainless steel, carbon steel, aluminium and titanium. 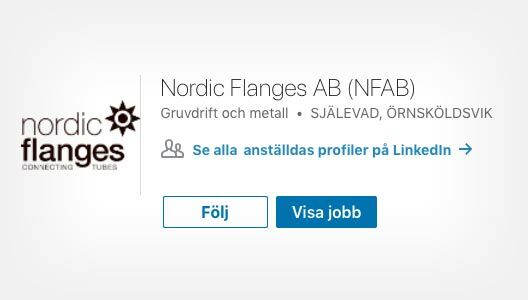 The production facility in Själevad manufactures flanges in stainless steel and titanium, and the company also imports falnges in stainless steel and carbon steel from Europe and Asia. Aluminium flanges and custom products are manufactured by group’s companies in Finland. Nordic Flanges Group is the leading supplier of industrial flanges in the Nordic countries. Our business idea is to deliver flange solutions in stainless steel, aluminum and carbon steel while providing the best customer service on the market. In order to fulfill our customers’ high demands on effectiveness, flexibility and quality, we base our offer on both self-produced and traded products, with logistic solutions adapted to our customers. Our corporate group combines manufacturing and development with trading within selected technically oriented industrial segments.